Show Media is proud to present the result of its recent collaboration with Richard James on the contemporary Savile Row tailor’s AW18 lookbook shoot. Inspired by the supersonic hedonism of an era that gave us Concorde and created the intercontinental frequent flyer, Richard James’s Sybarite collection is all about adventurous self-advancement and the uninhibited luxe of the iconic 70s jet-set generation. Sybarite is rich, bright, highly optical and effortlessly relaxed. 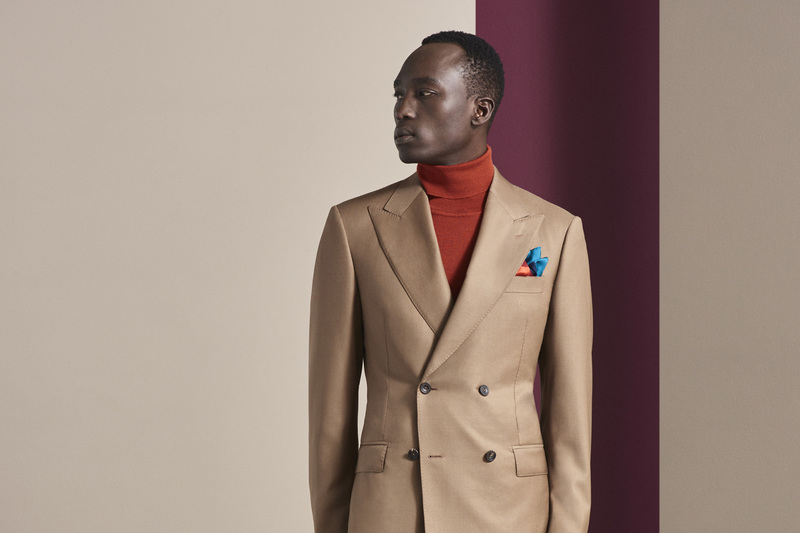 The lookbook shoot was art directed and produced by Show Media, marking the fourth seasonal collaboration between Show and the Savile Row house. We partnered with stylist Kenny Ho and photographer Philip Sinden on the shoot, drawing influence from the collection’s intense tonal colours, soft lines and rich textures. Standout pieces from the lookbook include a fine velvet cotton dinner suit in deep teal paired with fuchsia silk pocket square; and a midnight blue, moleskin cotton Harrington jacket styled over a blue ribbon print shirt and green step pocket square. Both are set against a warm, neutral background with deep plum overtones reflecting the depth of colour used in the collection. The AW18 Sybarite collection will be available online and in-house at Richard James from August.